This is a very simple recipe which results in the light and tasty knotted biscuits. ‘Chrust’ means brushwood which perfectly describes the appearance and texture of these sweet pastry twists. In some parts of Poland they use the diminutive ‘chruściki’, and in other parts ‘faworki’, meaning ‘grace’ or ‘favour’. It is connected with the name ‘faworki’ that used to describe colourful ribbons attached to male or female clothes (especially those that were given by knights to their ladies). And so fried faworki resemble twisted ribbons. When properly made, they should be very thin and simply melt in the mouth. 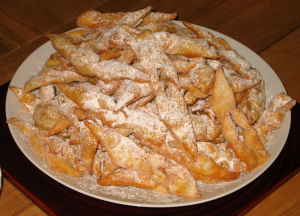 Chrust are often eaten during carnival (the time following the Christmas period and before Lent) but particularly on Fat Thursday (the last Thursday before Lent) when Poles prepare doughnuts, chrust and other pastries to celebrate that day. On Fat Thursday you can see in Poland queues of people standing in front of confectioneries purchasing all sorts of sweets (but doughnuts and chrust are the most popular among them). Put the eggs, spirit, white vinegar, sugar and salt in a large bowl and whisk together until all the ingredients are mixed together. Gradually add 1 tbsp of flour at a time until you have smooth, rollable dough. On a lightly floured surface roll out into a rectangle and cut into long strips about 1.5 inches wide. Take each strip and cut a slit down the middle. Push one end of the dough through the slit then slightly flatten to make a knot shape (see picture). Keep the dough covered in cling film as you do not want to dough to dry out whilst you are cutting and knotting. Drain on kitchen paper and dust with icing sugar whilst hot then cool on a wire rack.